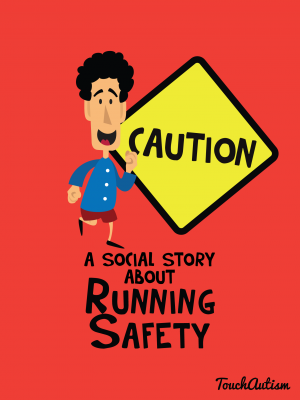 A social story & visual tool to help teach children about not running away, and running safety. 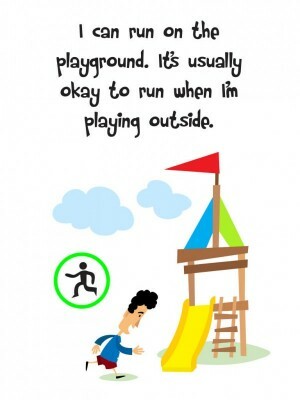 Many children love running away, exploring, and playing. They are curious and interested in exploring anything and everything in their world. She or he may want to touch, see, hear or even taste everything that they can. Not only is this normal, but it’s healthy to have a keen desire to check out everything in your world. What is important if your child, client or student is “an explorer” is that she or he understand boundaries and stays safe while exploring his or her world. Remember that your child needs lots of activity and enough time and space to safely burn off energy every day. 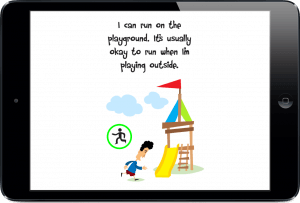 This app uses two tools to try and help teach your child, student or client to still enjoy the feeling of being free and curious while teaching them good safety skills so she or he does not become hurt or lost while burning off some of that boundless energy and curiosity! 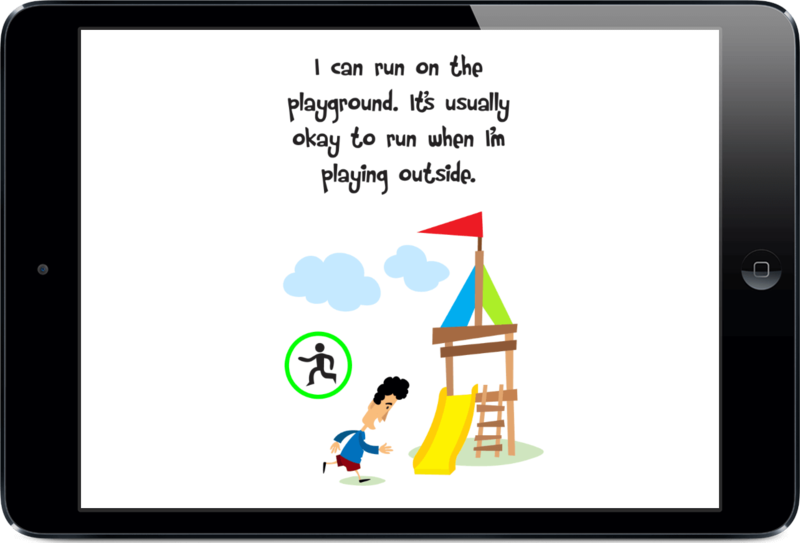 The social story included in the app uses simple text and fun illustrations to explain why it is sometimes safe to run, and sometimes not safe to run. 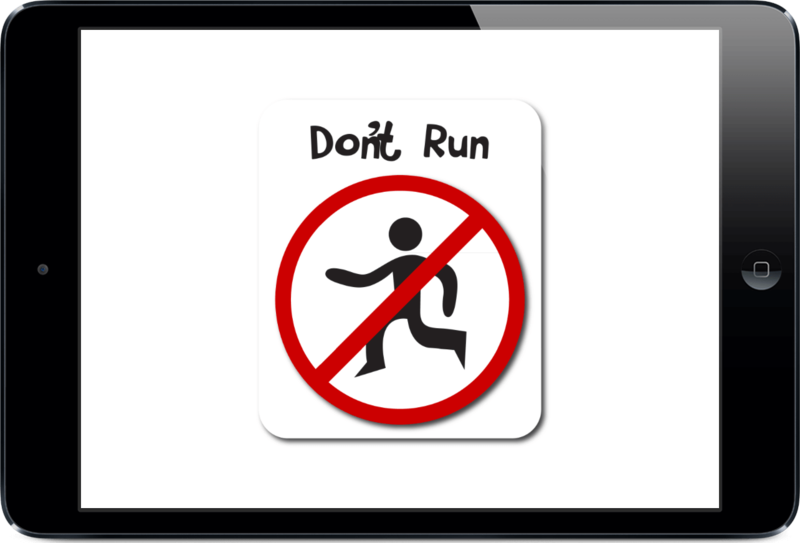 The story introduces the images that are used in the visual support tool and explain that one image means it is ok to run, and the other image means that it is not a safe time to run. The story also explains how your child knows when it is safe to run and when it is not, and what to do when they feel they want to run. 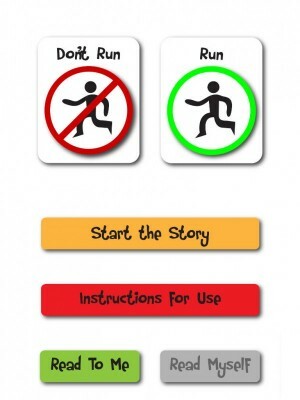 The story should be read several times with your child before using the visual tool in a safe place to teach them the cues for when it is OK to run and when it is not OK. The visual support is a way of making it very clear to your student, client or child when it is an OK time to run and when it is not. When you first introduce the tool make sure you are in a place where it is safe to run, such as a park or large yard. 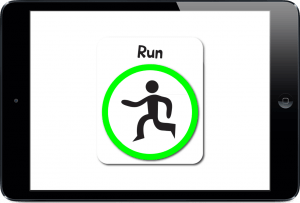 During the first “lesson” show him or her the walking icon and walk together, then show the running icon and run together. 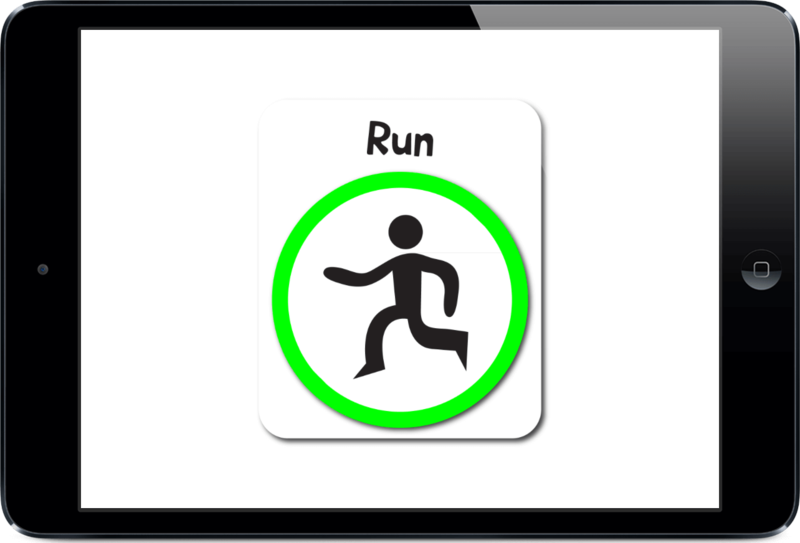 Switch back and forth between the walking and running icon, making it a fun game and encouraging him or her during both running and walking times. If she or he tries to run when the walking sign is up then you introduce the consequence. Usually that will be either sitting down or holding hands for one minute. After the one minute is up say in a happy voice “now you can try again, remember it is not a safe time to run, it is time to walk.” and then begin again. At first you will need to stay right next to your child, eventually you should be able to stay in one place to play a “red light/green light” style game with the two icons. This way your child will safely learn what the two icons mean, and what the consequence is for running when the “walk” sign is up. It is very important to pick a consequence and stick to it. As mentioned previously either holding hands, or sitting down for one minute should work, but you need to pick what is best for you and your child, student or client. Your rules need to be clear and the consequences need to be clear and so warnings are probably not helpful. 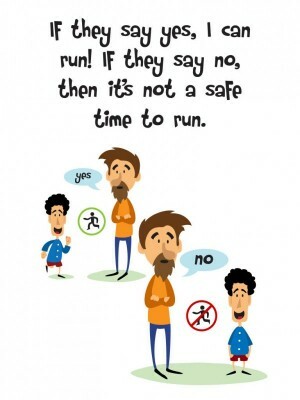 If they run when it is “not a safe time to run” they sit or hold hands. EVERY TIME. Your child, student or client will be less apt to test the boundaries if the rules and consequences are clear and unchanging. You may see caregivers giving their children three warnings before introducing a consequence. Many children do not understand a series of warnings, or a countdown. They only understand that sometimes when they perform the behavior you talk sternly to them and other times the consequence is enacted. It makes sense that they would continue the behavior under these circumstance because they never know what will happen when they do. You may feel silly sitting with your child in the grocery store or on the sidewalk, or it may be embarrassing or inconvenient if they cry or fuss to try and get out of holding hands or sitting in public. But being embarrassed or inconvenienced is much better than having your child run into the street or run away from you in a public place. 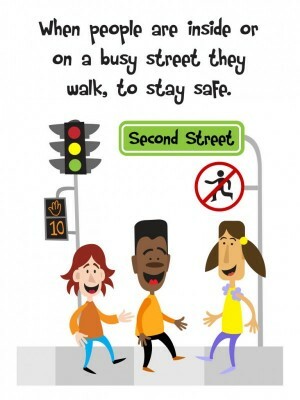 Teaching children their boundaries and the consequences for crossing those boundaries is the best way to keep them safe! Really helpful! 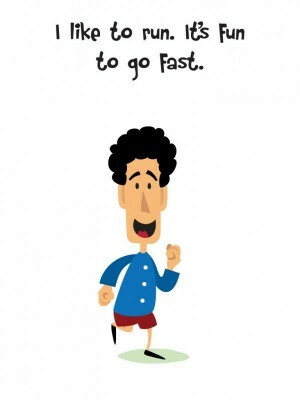 – I was looking for something to help a student with running inside of rooms, this really worked for him. 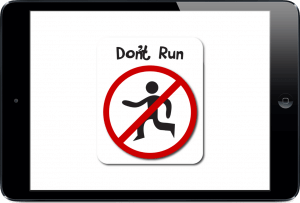 I love the visual cue, and the idea of practicing so that my student really learned the “run” and “don’t run” picture cues.